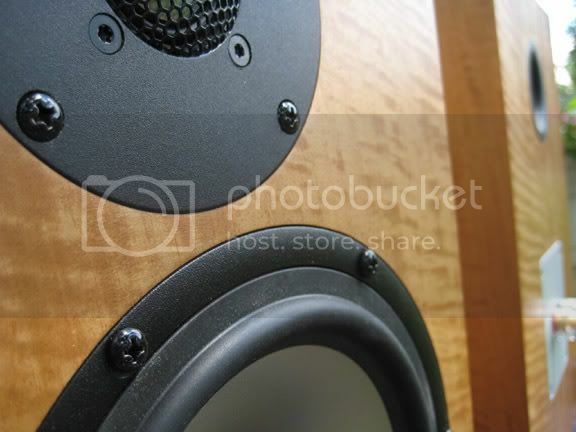 So, you have been into speaker building for a while. You have examined Zaph's site closely, as well as Tony Gee and Troels Gravesen. You enjoy 2 way stand mount speakers sans subwoofer. 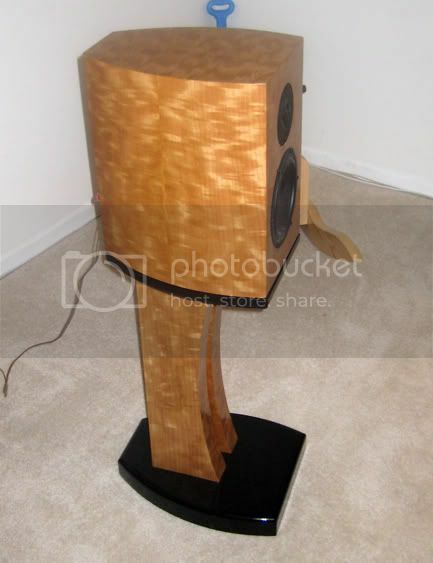 Do you build another L18 again, cause that is a really cool speaker? Do you do nothing and save up for the Zaph ZD5 in a ported floor stander, or the Troels CNO's? Or, do you wait for your friends on the PE board to suggest a really cool design that fits in your budget and sounds better than anything else you have built?? Come on... everyone has an opinion.. even you.. feel free to share. Would Jay's Usher 8945P and Peerless HDS two-way fit the budget? I would certainly consider it, given your requirements. Personally, I'd love to build something with that driver pair. I'd probably want to do something different, however. Perhaps a transmission line ala Paul K's excellent design (though I can't recall what tweeter he used). Those look very nice. Great job on the woodworking. Sorry, can't give you a recommendation on what cone 'n dome box to build next for $500, but I'm sure others here can. Paul, thanks for the suggestion, that is certainly something to consider.. It may fit the budget just fine. Though, the crossover seems slightly complicated. Though the ZD5 crossover is not the simpliest in the world either..
6" to 8" 2-ways are all very well. have you done a 3-way speaker yet? there are gains to be made in clarity and bass extention. Go for the ZD5. The Scanspeak 15W is incredible for clarity. BTW your cabinets are really nice. I think you're referring to my Marcato, an MTM with the same Usher woofers and a BG Neo3PDR planar tweeter. The 6 drivers have a total list price of $540 and the crossover components cost another $77 for the pair. I second the recommendation for a 3-way. You never know, you may never look back. S7horton could add a woofer to one of his current 2-ways, as an alternate or additional project. could you describe your listening experiences/ preferences from your builds? great choices and exceptional excecution of the builds by the way. Last edited by blue934; 04-11-2011, 05:24 AM. That thought had crossed my mind. I can think of other drivers I'd like to see together. Like the L18 and a Peerless HDS.. But, without measuring equipment, or an understanding of how to design crossovers, I'm not sure I'm ready for that. I have always been a fan of 2 ways. I've had my share of three ways when I was into buying commercially. For the money I was spending, 2 ways always sounded maybe.. I don't currently have any of the speakers shown. I tend to build them, listen to them for 6 months, and then get rid of them. Seems I'm always ready for the next project. The Extremon had excellent bass, the best I've heard from a 2 way. The SR71 was nice, pretty laid back, and well refined. The L18 was punchier, and the most fun of all the speakers. I'm a nut for really good imaging, and a crystal clear top end.. I'm with Mark here. Put that 500$ towards measurement gear, and maybe soundeasy (or just use speaker workshop or Jeff B. 's PCD software). After that you should have plenty of cash left to design, build, and tweak a two way using "budget" drivers. DIY something that hasn't been done. I would have a different idea what to do with that $500. Buy a DCX2496, some good 10" or 12" low distortion woofers, build some cabinets, and have modular woofer boxes to add the last octaves with low distortion and seamless integration with the 2 ways. And yes, a DCX can allow absolute seamless extension with a pair of good LF modules. In addition, the DCX can modify the subjective 'tightness' and signature of the bass to your preference(s). In addition, the DCX will give you the ability to modify the response of your main speakers to your preference as well. You may have to spend a little bit more than $500, as you may not already have an additional amplifier to drive the new stereo subs.